BlackBerry App World updated to v2.1.1.2 | BlackBerry Blast! 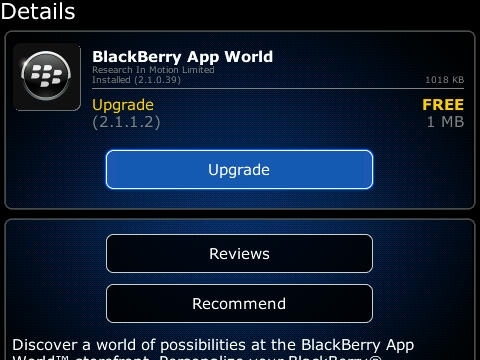 RIM has updated the BlackBerry App World to V2.1.1.2. In fact, you may already be getting the notification that BlackBerry App World v2.1.1.2 is now available for download. There is no changlog listed so we're not sure what new features have been added. If you haven't received the notification yet, refresh the App World and you'll probably be prompted to download the new version.